These three photographs show the James Foster residence. 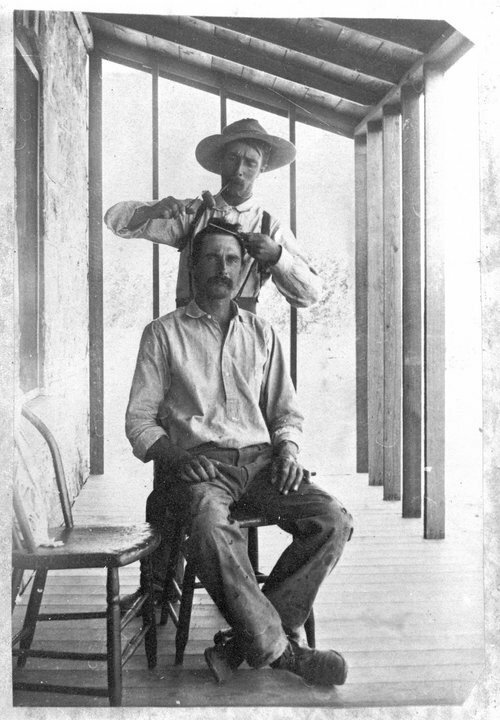 The first photo is of James Foster giving a haircut to Frank W. Brandram on the porch of the Foster home. The second has a group of people in front of the home. People in the photo are Mrs. J. Fenton Pratt, Tom L. Pratt, James Kirk, Tom Pratt, Pat Walsh, Mabel Pratt, Jim Walsh, Bill Walsh, Mary Holliday, Charles Taylor (standing). Those seated are Abram Pratt, Mrs. George Pratt, Hannah Walsh, and Annie Pratt. The third photograph shows people standing farther away from the house.